Guy Spy: Do Men Like It When You Watch Sports With Them? 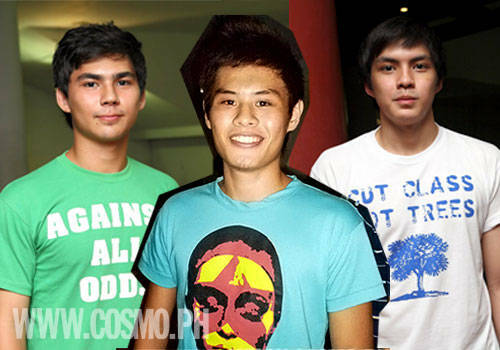 As UAAP season opens, Cosmo chicks can look forward to seeing HOT basketball players--and cute sports fans. But do these studs want you in the bleachers with them? As more and more college chicks are turning to Cosmo, we of course want to check out what you, fun, fearless kolehiyalas care about. And we know that one of them is the UAAP or University Athletic Association of the Philippines, which opened its 73rd season last July 10. It was an exciting opening weekend, with the men's basketball teams of De La Salle University (this season's host), University of Sto. Tomas, Far Eastern University, and Adamson University getting their first taste of victory this season. This weekend marks another series of games. Tomorrow, National University battles it out with FEU at 2PM, and University of the Philippines faces AdU at 4PM. There are also two matches on Sunday: Ateneo vs. UST at 2PM, and DLSU vs. UE at 4PM. Students from all eight participating universities flocked to Araneta Coliseum last Saturday for the opening ceremonies, where Cosmo spotted lots of fashionable college chicks (see the Style Paparazzi story here). Of course, we were also quick to see good-looking, sports-loving guys among the crowd. Since everyone was in sports-fan mode, we just had to ask these guys one of our pressing questions: Do you like it when girls watch sports with you? Why or why not? It's your chance to find out if your guy really enjoys bringing you to the games, or if it's something he'd really just watch with the boys. Then again, at least those who are not sports fans among you now have an excuse not to watch the games with him! Launch our gallery to see these cute guys' answers and view their photos.